This was a big gamble. I cleared my throat, checked my mic a couple times. One last look around the room. Here goes. The audience obliged with a mix of laughter, groans, and probably a few people checked that they were in the right place. 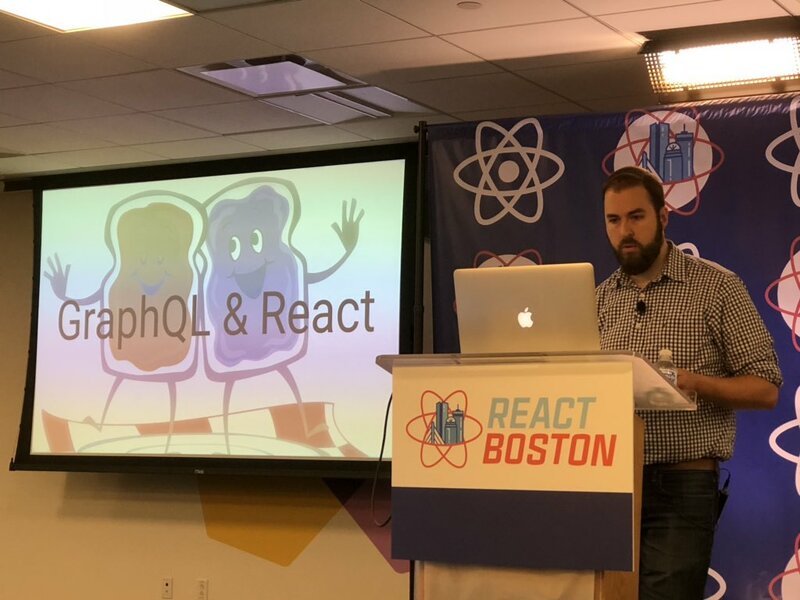 It was a somewhat edgy joke, but there was a grain of truth: We did have a lot of GraphQL talks at React Boston. 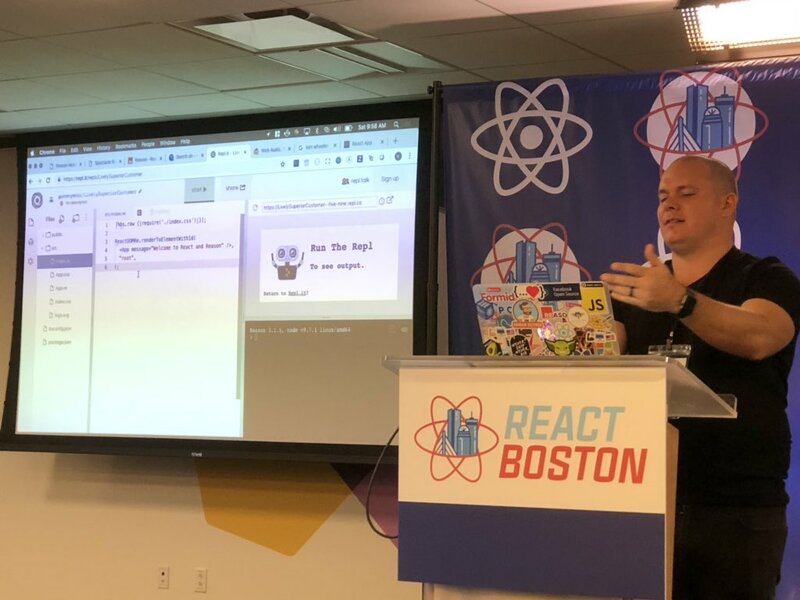 Conferences are curious things, and React Boston was curiouser: dozens of Wayfair Tech employees volunteering their weekend to put on an event for hundreds of React developers paying to fly into Boston to spend their weekend learning about React. And what a packed weekend it was: With 17 full talks and 8 lightning talks, it was chock full of technical deep dives and passionate exhortations. I’m supposed to write the weekend up here but if I did it any justice it would just be a transcript of every talk and every hallway conversation. So I won’t. Instead, I’ll just focus on three themes for the future. Chris Toomey of the wonderful Thoughtbot and Bikeshed podcast did one of the best React + GraphQL intros I have ever seen. First he made the philosophical link between how React rethinks how we separate concerns on the frontend, and how GraphQL adds a missing data layer at the component level. As a bonus, he also showed the impressive modern tooling integration between Typescript for React frontends and typed endpoints as a result of GraphQL schema backends, which everyone was buzzing about after. Hillary Bauer and Mark Faga of ezCater (who also catered the incredible food at the conference) showed us how to mock and test Apollo GraphQL + React apps, and launched their toolkit, Lunar, for making the process a lot easier. From my hallway conversations it was clear that GraphQL was at the very top of everyone’s “want to learn” list. React has succeeded and survived in part by studiously doing one thing well and avoiding being a full framework — but because the set of concerns in making performant apps is far bigger than those directly addressed by React, there are a lot of gaps that developers often miss. React developers deal with this in two ways: community-maintained frameworks (like Gatsby and React-Static) and libraries, and growing the responsibilities of React itself. Houssein Djirdeh of Google taught us about the state-of-the-art set of easy wins to make React apps performant, from using the newest React DevTools Profiler, to dynamic import and loading with Webpack and various React “Loadable” component libraries, to using Service Workers and Google’s Workbox to make awesome progressive web apps. As React enters its sixth year, it is clear that the idea of React is growing bigger than just its present day implementation, and all these assertions are being tested, and boundaries being pushed. Florian Rival from GDevelop showed off the biggest production React + Web Assembly app in existence today. (I think?) 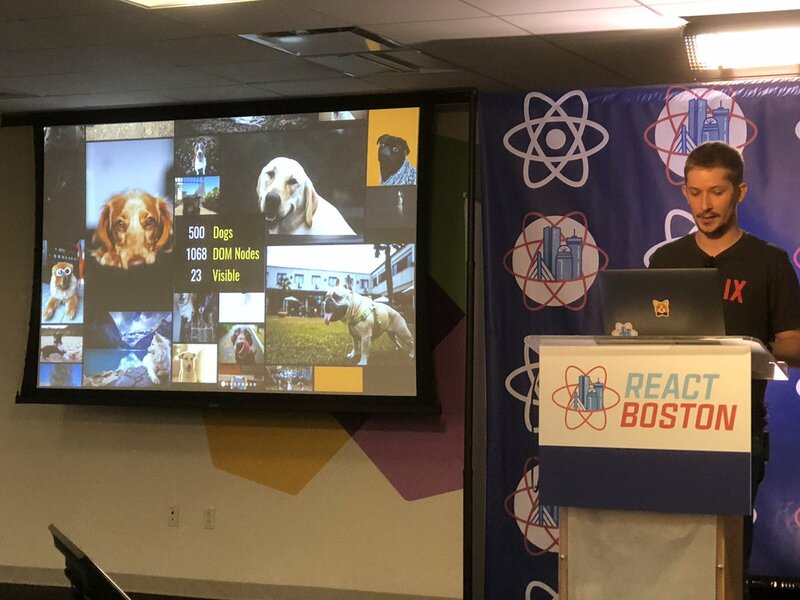 Both days were capped off with VR-related talks — from Vladimir Novick who showed us real React Portals and Matt Hamil with a Frogger demo showing off React-360. It is clear that alternative React stacks and renderers are an extremely fertile area of exploration right now. As a naive technologist I admittedly often tune out during talks whichfocus more on the people behind the technologies we use. But of course, these are arguably the most important topics that guide our day-to-day experience and our careers. 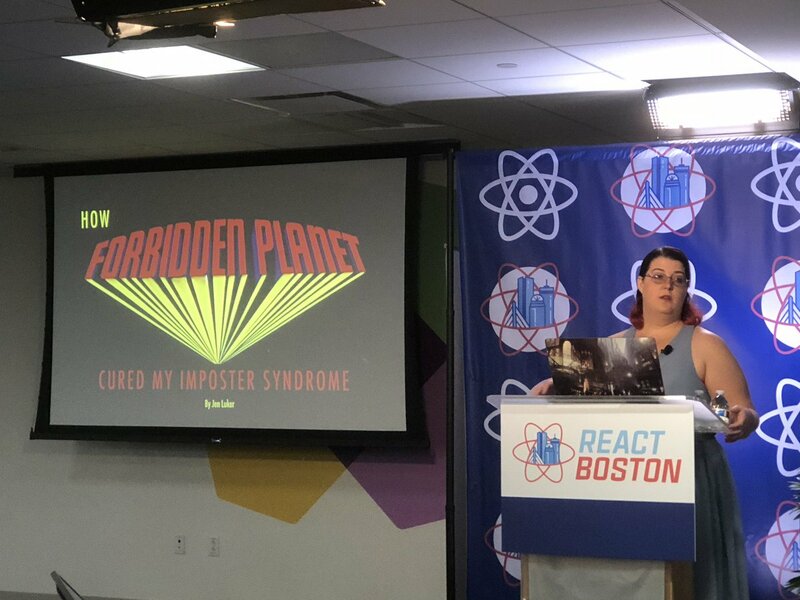 React Boston was also not lacking in this department, and for me the standout talk was Jen Luker’s talk on imposter syndrome. As a career changer myself with no CS degree I have dwelled on this a lot, but Jen’s format using the hit 1956 Sci-fi film Forbidden Planet was captivating and visually stunning, while also remaining eminently relatable. In particular, her warning symptoms for impostor syndrome/burnout resonated with many folks during my Twitter and hallway conversations. Relatedly, I also recommend the hilarious and wisdom-packed lightning talk from the not-junior-anymore Erin Fox on Learning React Native as a Junior Engineer, which touches on more recent experiences with the same realities. 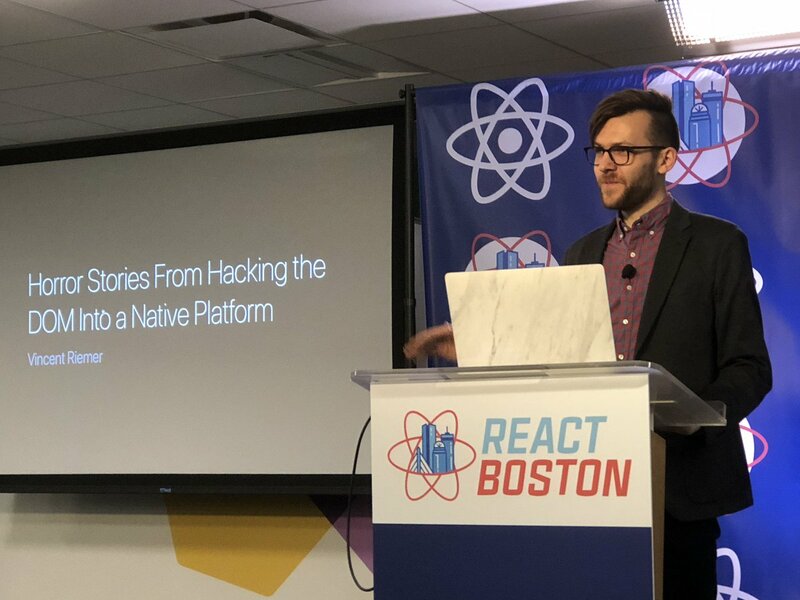 Conferences are notorious for thought leading on the most “hipster” technologies, but at React Boston I met folks who were still working with everything from React 0.14 to interoperating Backbone.js and jQuery. I haven’t even had space or time to process my favorite talk, Josh Comeau’s The Case for Whimsy. (If you think you saw it at React Europe, you haven’t — watch this talk when it comes out on Youtube). 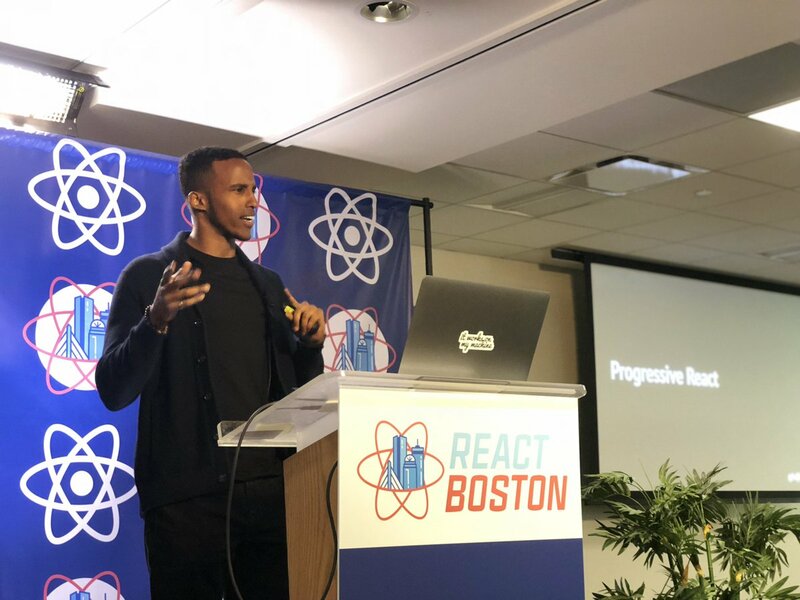 At its core, React Boston was where practitioners and tinkerers could meet to share their thoughts on what is, and dream about what could be. As a New Yorker I am also personally happy that there is such a great, now regular, React conference on the East Coast, which makes these occasions more accessible to more folks who do React for a living. The talk videos will be up soon on Youtube, but for the participants who gathered in Boston this past weekend, these great talks are already forever etched in our minds.